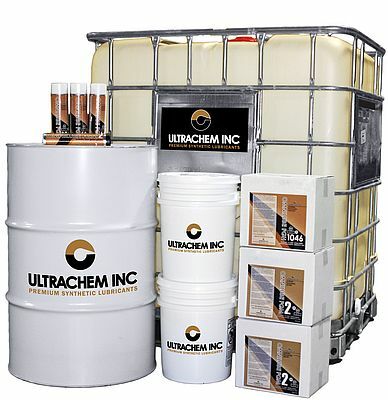 Ultrachem has developed a new line of Omnilube food-grade rotary screw and reciprocating air compressor lubricants with improved wear, oxidation and lubricity. According to the supplier, field tests have shown these lubricants - Omnilube 32/46, 68, and 455 - to outlast other synthetic H-1 lubricants by 50% to 100%. The food grade products meet all of the requirements of the USDA and FDA H-1 regulations, 21 CFR 178.3570, and conform to the requirements of NSF. They are also approved by the Orthodox Union for Kosher use. The lubricants are fully synthetic compressor oils formulated from the highest quality polyalphaolefin (PAO) base oils with a superior proprietary additive package to achieve long life. Omnilube 32/46 and 68 are designed for rotary screw compressors and, depending on the rotary screw design, give a service life of up to 8,000 hours in good operating conditions. Omnilube 455 is designed for reciprocating compressors.Omnilube® products are ideal for use in meat, poultry and food processing (H-1) plants. The products can be used for use in meat, poultry and food processing (H-1) plants.